This election is the real deal, my friends. This is the first time I've ever voted early. You know - I honestly don't even know if it's something that's been offered before. I just know that this year, for THIS election? There was no way I wasn't voting. And if voting early guaranteed that for me? That's what I was going to do. And I want to share a small moment that was really kind of cool and empowering for my 9-year-old daughter. 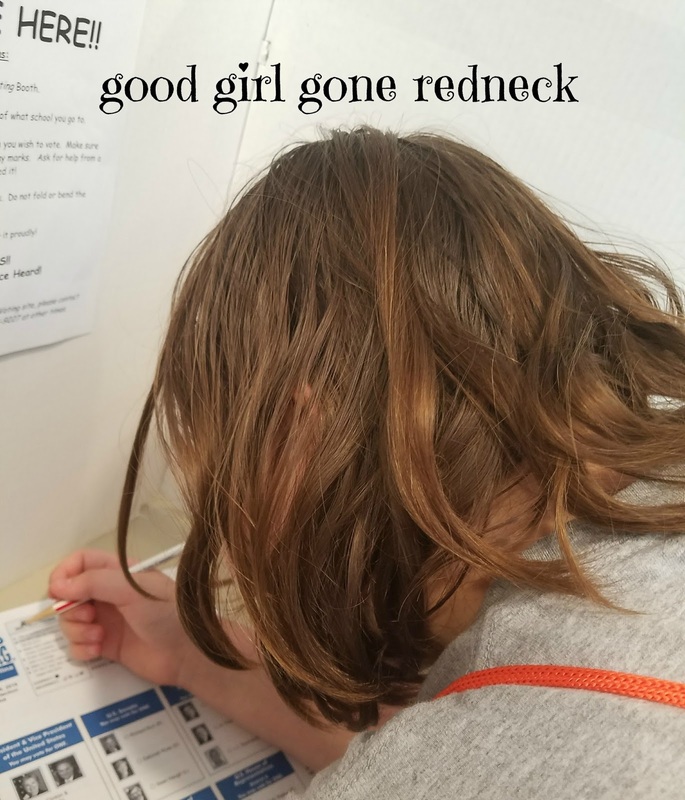 She got to vote, as well. Durham County in North Carolina coordinated a Kids Vote event, to have a polling "booth" outside of our polling area. And so she not only received a sticker saying she was a future voter from the regular polling place - but she also received a Kids Vote sticker. Pretty cool, huh? Here's a pic of her casting her vote. It's about the only place we could take pictures in there - so I took advantage. Plus I thought it would be a great memory. Plus, don't tell anyone, but she was right there with me in the polling non-booth (it's so not a booth, my goodness, it was more out-in-the-open than ever before!) and witnessed as I cast my ballot today for the 2016 election. And that was kind of cool, as well. Just a quick snippet of our day that I thought I'd share with you. If you haven't yet guessed, I'm doing NaBloPoMo again. Which has been kind of cool because I've just sat myself down and shared whatever it is I've wanted to share. And I like it that way, because it's quite old-school blogging. And sometimes? That is simply the best way to be.